The Pays de Loire  is an extensive region of north-western France located broadly to the west and south-west of the French capital Paris, separated from it by the adjoining region of Centre-Val de Loire with which it shares many affinities. The Pays de Loire is somewhat more diverse, however, and has a long coastline along the Atlantic Ocean, forming the northern part of the Bay of Biscay, within the area known as the Vendée. 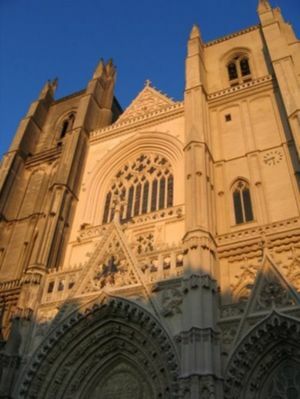 Luçon: As the episcopal seat of the Diocese of Luçon, this picturesque city has been the spiritual capital of the Vendée since 1317. A statue of its most famous bishop, Cardinal Richelieu, stands outside of the cathedral. The language here is much the same as the rest of France, with more northern than southern influences due to the influences from Paris, and basic French will be easily understood. The Nantes-Atlantique Airport (NTE) is the only international airport in the region. 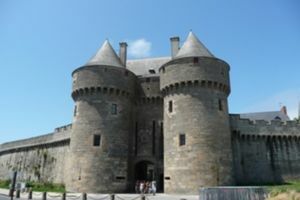 From the airport it is easy to get to Nantes by bus or cab. There are also several fast train services per day directly from the Paris Charles de Gaulle airport (CDG) to Nantes, Angers and Le Mans. Train is the easiest way to get into the Pays de la Loire from Paris. Cities served directly from Paris include Le Mans, Sablé-sur-Sarthe, Angers, Ancenis and Les Sables d'Olonne. Nantes, Angers and Le Mans are the main train and bus hubs in the region, connecting to other cities. Nantes, in particular, is the main hub to access coastal cities. TGV, the fast train service, connects Paris to Le Mans in 1h, to Angers in 1h30 and to Nantes in 2h. General advice about train travel in France is fully relevant in Pays de la Loire. National bus services have flourished in recent years, with many private bus companies leading the charge. SNCF (the national railway company) also operates buses, either locally (TER services) or between major cities (through its company Ouibus). Multiple freeways connect Pays de la Loire to other regions. From Paris, the A10 is the main axis. During holiday season, traffic on this axis can get very bad, it is thus recommended to avoid peak times, such as Friday and Sunday evenings. While hitchhiking isn't easy in France in general, hitchhiking along the A10 may be an option to get into Pays de la Loire from Paris, if you're patient. Travellers wishing to see more of the Loire Valley can continue further east into the adjoining Centre-Val de Loire region, studded with additional historical cities and chateaux at sites such as Bourges and Saint-Benoît-du-Sault. This page was last edited on 24 May 2018, at 13:56.